User experience isn't the first thing some companies would consider when redesigning a portal for financial advisors. 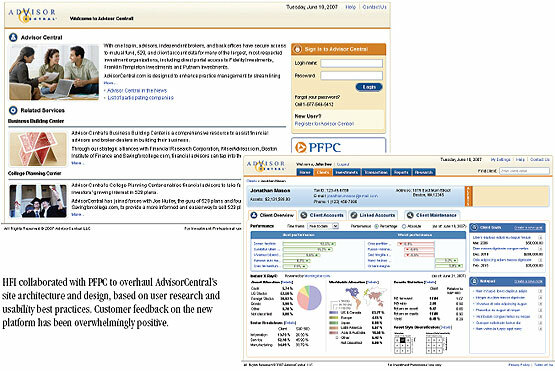 Yet PFPC™ realized that improving user experience was a strategic element in the redesign of AdvisorCentral®. This Web portal is used by financial advisors, broker-dealers, and investment company back offices, representing 48 million accounts. PFPC is a leading provider of processing, technology, and business solutions for the global investment industry. AdvisorCentral also serves as a marketing tool for mutual fund companies looking to expand their brand awareness among financial intermediary channels. Despite its potential to simplify client servicing and streamline advisors' daily functions, AdvisorCentral was not fully meeting user needs. People were complaining about the user experience. User experience: Some users felt the platform focused too much on research and needed more emphasis on helping financial advisors mange their book of business. HFI realized that AdvisorCentral's competition wasn't just other aggregation platforms – it included alternatives such as brokers' own internal transaction systems. Functionality and data architecture: To make AdvisorCentral more useful and marketable, PFPC sought to aggregate more funds, information, and resources. Integration with CashEdge (a transaction processing and reporting platform): Integrating an established piece of technology into another usually presents a series of challenges, such as blending the information architecture and navigation, or preventing a degradation of performance due to poor cross-tool communication. PFPC set out to address these issues to improve AdvisorCentral's competitive position, market perception, and user adoption. Investing in user experience design was key to getting more financial advisors to transact on the platform, so Human Factors International (HFI) was brought in to guide the user-centered design process. Since the scope of the redesign was so broad and required deep, fundamental changes, HFI worked closely with PFPC's development team throughout the implementation process. This collaboration was critical to the success of the project. "You've done a lot of work on this. It's a far cry from what we have now in AdvisorCentral." "This is very complete. I'm amazed by how much you've done." "This fits what I want – I think it's fantastic." Although HFI's tactical recommendations yielded quick wins, HFI also helped PFPC develop an appetite for a longterm, strategic user experience program. 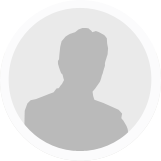 The AdvisorCentral product group has already taken strides towards institutionalizing user-centered design, including a repository of reusable interface design templates and a skills development program for designers and developers. This makes for exciting times at PFPC and the finance industry as a whole. As VP and Senior Director Eileen Gilfedder explained, "the next generation of Web portals can become the 'financial supermarkets' first predicted at the dawn of the Internet era." "HFI complemented PFPC’s industry knowledge with their sophisticated expertise in usability and user experience design. Our redesigned AdvisorCentral portal now combines leading-edge technology and functionality with a firstclass user experience. It lets financial intermediaries do their job more easily and provides tools to help them increase their business."